No Bridesmaids for me. Just 2 MOH and Secondary Sponsors. I also opt not to have photos with the Secondary Sponsors during the preps. Rhed Sarmiento was my Coordinator. No regrets. I love her. 8. Stay in the hotel for 2 more nights. Some weddings end at 9pm and the check out is at 12 noon the next day. The thought of this makes you want to rush or make sure everything is ironed out because you are already leaving the next day. If you know that you have 2 more nights in the hotel after your wedding, this triggers the brain to be more relaxed. If this can't be done, avoid going to work two days after you said "I do"
First night was where we had wedding preps, second night in Tagaytay. Then we went home to Ilocos then Phuket for 7 days. 9. Eat. I know it will be difficult to digest and have appetite because you are nervous, happy and emotional at the same time. So my advice is, pick a food that you love, that you can eat in small amounts and "safe", just in case it lands on your robe or worse, gown. I have been juggling 4 events for the past few weeks. I can’t believe I am so busy freelancing! It is actually quite challenging to get up, work without a boss and not be distracted by social media, news about our new President, Pinterest, recipes, etc. In short, the struggle is real! Not to mention I do not have to time in and out! Plus the gloomy weather and the irresistible bed! Haay!! Going back, I have been hectic with 4 things: IDO!Hosting, Angat Pilipinas Premium Workshop and Awards Night, Freelancing Fair, and Ready to Marry. A little bit too much but thrilled I am doing it all at the same time. Let me give you the details I am excited and thankful about! 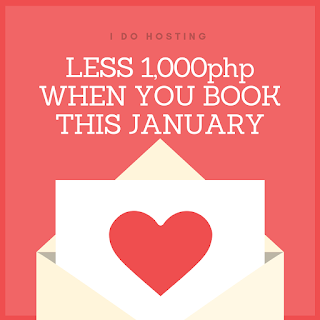 IDO!Hosting is what I have been doing permanently. I am an event host and I do emceeing on wedding receptions, debuts, corporate events, christening, etc. 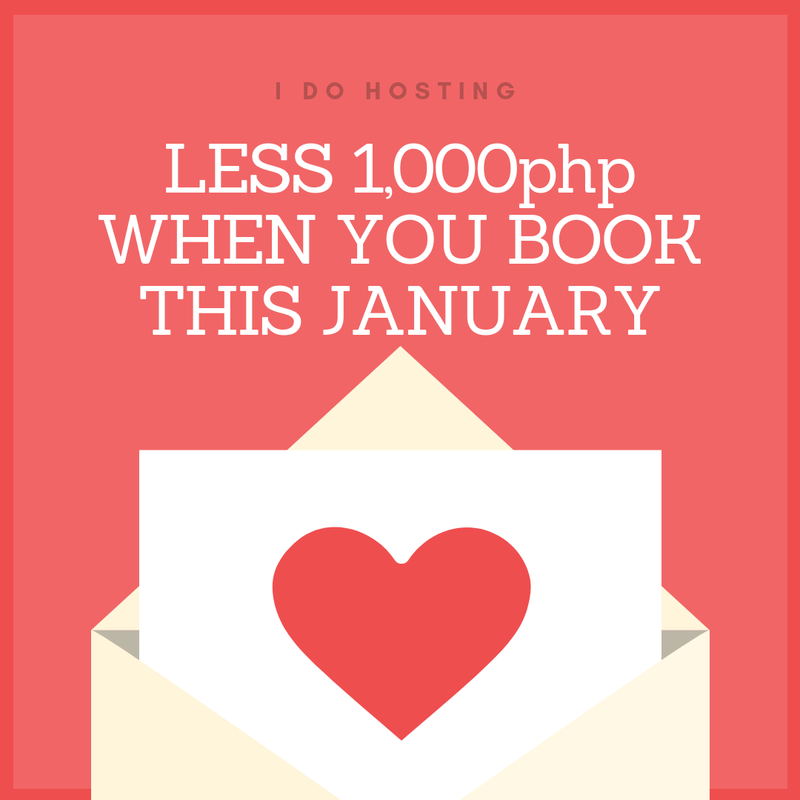 I launched myself as a professional host last December because I am practically doing it all my life! Since my educational background is Theater and I have 8 years of experience in teaching English, I decided to do it “for work”. Since December, I have not had a zero event in a month! I guess, we just gotta do what we gotta do! If you want to know how I started freelancing, check this out! Angat Pilipinas Premium Workshop and Awards Night is a huge event that Ginger Arboleda (OIC of Manila Workshops) trusted me with. This half day workshop and Awards Night will happen on September 24 at the Tent Acacia Estates, Taguig. I am pleased to be working with the men and women behind Angat Pilipinas whose advocacy is to empower Filipinos through financial freedom. They have been doing trainings, encouraging OFWs and organizing events to enable Pinoys to start their business, be free from debts and be financially secured. Freelancing Fair is the first for the Philippines and first for Manila Workshops! Looking at its title, it is a day for freelancers (just like a job fair)! I am in-charge of Logistics and has been helping out here and there as well! I will let you know more about this event soonest! Ready to Marry. Let me begin by saying this is what I am most excited and nervous about. This is a workshop that I have envisioned, dreamed about, shared with my husband and closest friends, prayed for (and still praying about), and discussed with Manila Workshops. This is something very close to my heart!! 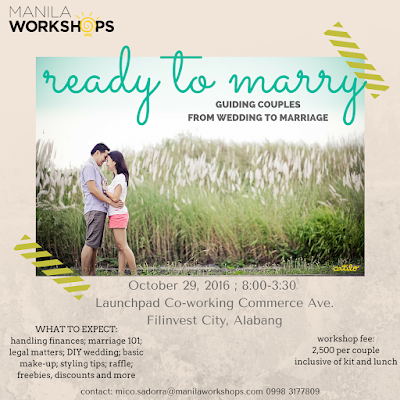 Ready to Marry is an intimate talk on marriage and weddings. I have always believed that preps for the wedding and the life ahead should go hand in hand, not break your budget and should be looked into (especially the marriage part). This is the #hugot of this workshop. I am really trusting that the engaged couples would consider seating down with the experts and learn on what they are getting into! The workshop fee us 2,500 per couple (8:00-3:30). Inclusive of lunch and kit. 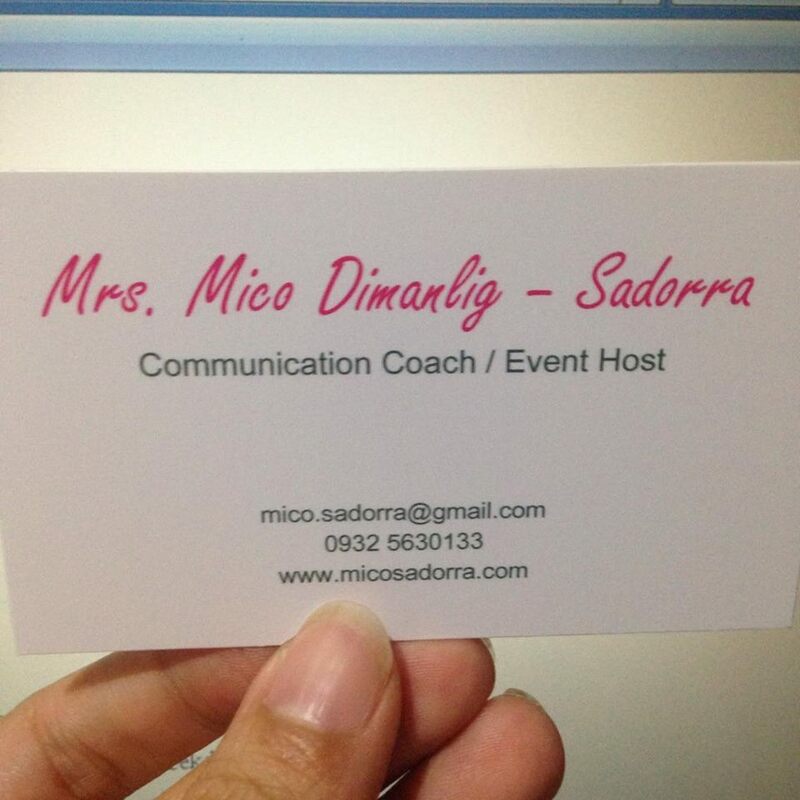 My life as a freelancer started last December 2015 when I decided to print out my name on a card and (finally) declare myself as a professional event host. I have been hosting all my life, and so I thought it would be appropriate to do it actively on the side. Thankfully, I mostly received “dapat lang”, “buti naman”, “bakit ngayon lang?” from family and friends. Yey! That was definitely a good sign! Actually, what was intimidating was when I was seconds away of clicking “enter”. It was a battle I had to fight hard. There was a mixture of excitement, kaba and fear. I was so afraid that no one will ever get my services and that my cards will be put to waste. I was also into the idea that there are a lot of hosts so “why would they want to get me?” However, with my eyes almost closed and with a silent “bahala na” I just did what I had to do -- I declared myself as a professional host and gave a go signal to have my card printed. Looking back, I was so glad I clicked “enter”. I am so happy I jumped into the world of freelancing. Definitely a right choice. Do you also want to be a freelancer? My tip? Just do it. 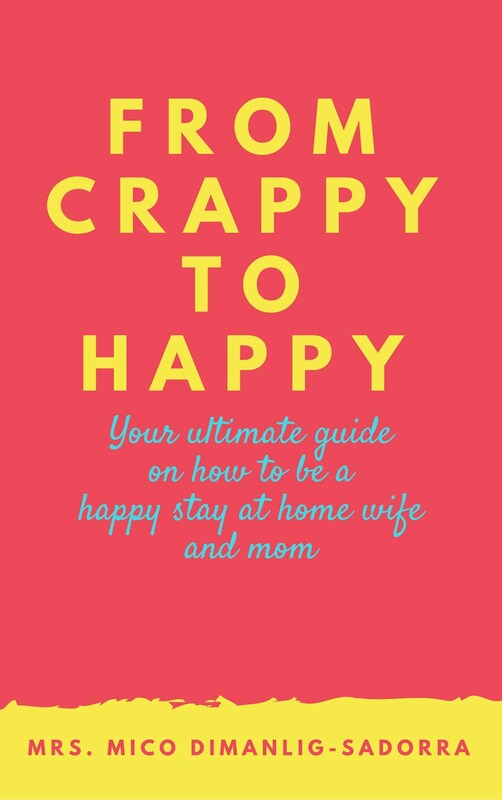 If you have been passionately baking, cooking, fixing, decorating, writing, editing, etc. for free, then that means you already more or less “freelancing”, only that, you have been neglecting the business side of it. So, why not do it “professionally” na ‘di ba? And yes, just like me, you will always have excuses. I am not saying that you do away with it, but maybe what you can do is to figure out which ones are valid and which ones are totally absurd. Take your time and write them down. Analyze, compare, argue with yourself then decide. And yes, you do not have to quit your job once you have decided to be one. You can start slow and just do it on the side. In time, you would notice when you are ready (only if you want) to quit your 8-5 routine and do something really really great with your life (yes, I am being biased here). Freelancing is an awesome choice for a stay-at-home wife and mom like me. I am still able to spend a whole a lot of time with my husband and son without forgetting of the things I am good and passionate about. Freelancing is God sent. He gave me the talent, and as always, He gave doors to be able to use it. As always, praises be to Him!